There's no need to to "Back in Time" or own a DeLorean — you can now buy a Flux Capacitor for your own car. And, no plutonium is required! 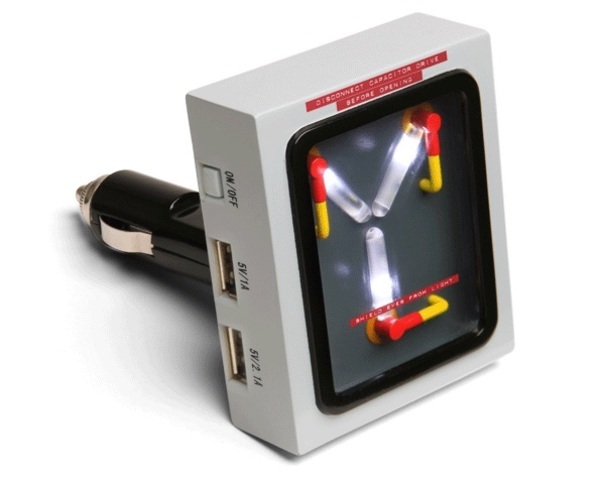 This Flux Capacitor USB Car Charger , designed by the geniuses at ThinkGeek.com, allows two devices to charge simultaneously so there is no fighting over whose phone battery goes dead first. When you plug it in to a car lighter, the Flux Capacitor USB Car Charger lights up like just like Doc Brown's "Back to the Future" time travel invention. The items is available for more than 50 percent off at a sale price of $11.99. Just remember: even with the flux capacitor you should never drive 88 miles per hour. Looking for more "Back to the Future" gear? Check out a few more deals below.